This week, I am going to do something a little bit different. Instead of talking about the latest paleontology news, I want to take a minute to talk about a subject very important to me: creating a supportive environment for women and underrepresented groups in science. Even though many young women are interested in pursuing careers in science, technology, engineering, and math, the proportion of women in full-time professorships in these careers remains notably small (24.3%*). Minorities make up an even smaller fraction of the full-time professorships (6.2%*). I am a Hispanic woman (thus both a woman and a minority), and one of my career goals is to improve these numbers. One of the ways I’ve decided to do this is by joining forces with a colleague (Abby West) and an amazing artist (Amy Gardiner) to create a children’s book about Women in Paleontology! When Abby and I were growing up, we didn’t have any role models in paleontology that were women because the information was not out there. We want young women of all backgrounds to have a resource that inspires them to learn more about paleontology. Not many people outside of paleontology realize how many women are actually in the field. This book will feature bios of women currently active in our field, talk about how they got interested in science and paleontology, and what they are researching. We will intentionally span the whole spectrum of paleontology careers (artists, professors, curators, preparators, etc.). It will also feature a history section – accurately portraying the discoveries of the first women paleontologists, featuring women like Mary Anning, Lousie Kellog, Tilly Edinger and so many more. The purpose of this book is to show the diversity of research projects, ethnicities, interests, and paths to paleontology in a colorful and fun way that will encourage children to follow their dreams. The book will be published in both English and Spanish so that more children can read it. We will be launching a kickstarter to fund this project early in 2017. Until then, I will be blogging about one of our featured women in paleontology once a month on this blog. If you want to be kept updated about the project, please sign up for our newsletter [here]. 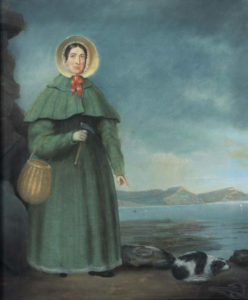 Famous portrait of Mary Anning and her dog, Tray.